If you could travel to any country right now where would it be? I can easily think of at least ten that I’m dying to visit but I think I’d be happy almost anywhere in Europe along the Mediterranean coast. The little taste we got from our trip to Cassis was enough to make me fall in love. The colorful buildings, the turquoise water, the fresh and flavorful FOOD. If there’s any cuisine that knows how to make healthy food taste incredible, it’s Mediterranean. I thought about persuading Brandon to take me since he’ll be traveling to Germany and Belgium this summer but ultimately I decided it’s best to just stay home with Coco. It took us almost six months to nurse her back to good health after leaving her the last time so I don’t want to risk it again. I swear, sometimes I think having an infant would actually be easier than a 13-year old, 60-pound mutt! But she’s worth it. There’s nothing quite like a dog’s love. Hopefully I’ll get back to the Mediterranean Sea one day but in the meantime, I plan to make the most of it by enjoying the flavors from the comfort of home. 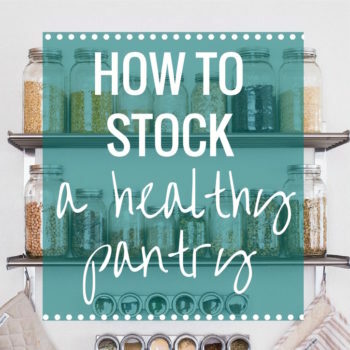 Whether it be from Quinoa Casserole, Stuffed Peppers, or a quick and easy Three Layer Dip. So, about those layers. The picture above might look familiar to those of you who have had tzatziki because that’s basically all it is. 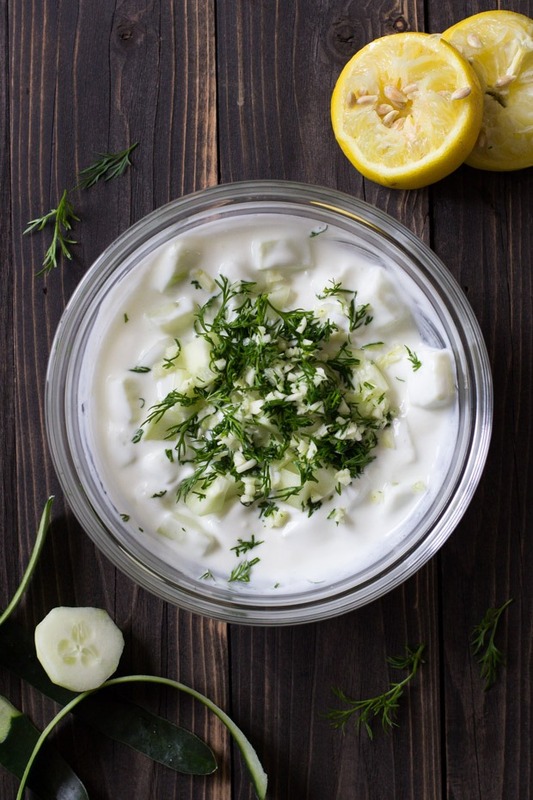 Diced cucumber tossed with Greek yogurt, fresh dill, minced garlic and a touch of lemon juice. It’s good enough to eat on it’s own but I layered it on top of hummus and then topped it off with diced olives, artichokes, red pepper, tomato and a little bit of fresh dill. 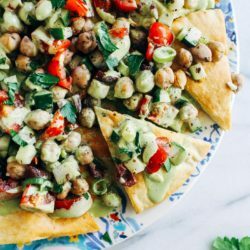 The whole thing comes together in less than 10 minutes and it looks pretty too which makes it perfect for a last minute appetizer to serve for guests. 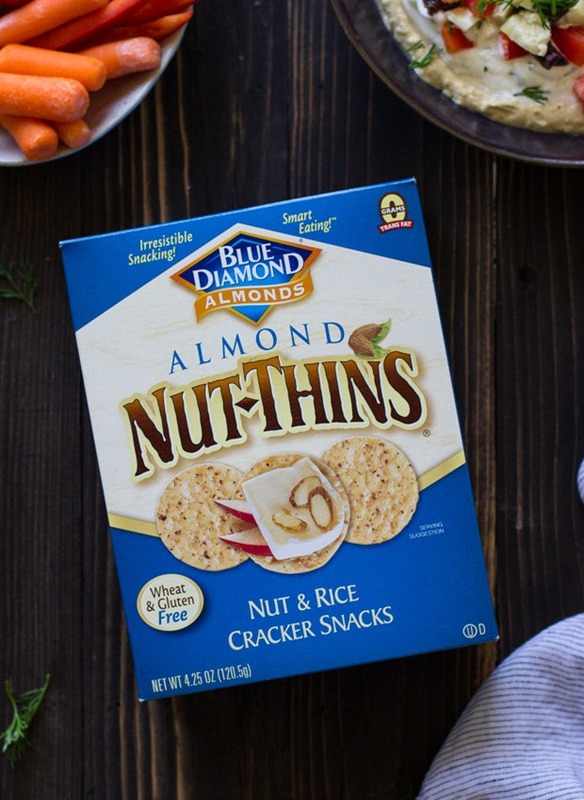 And if you or your friends are eating a gluten-free diet, you can pair it with fresh veggies and Blue Diamond’s Almond Nut Thins for dipping. 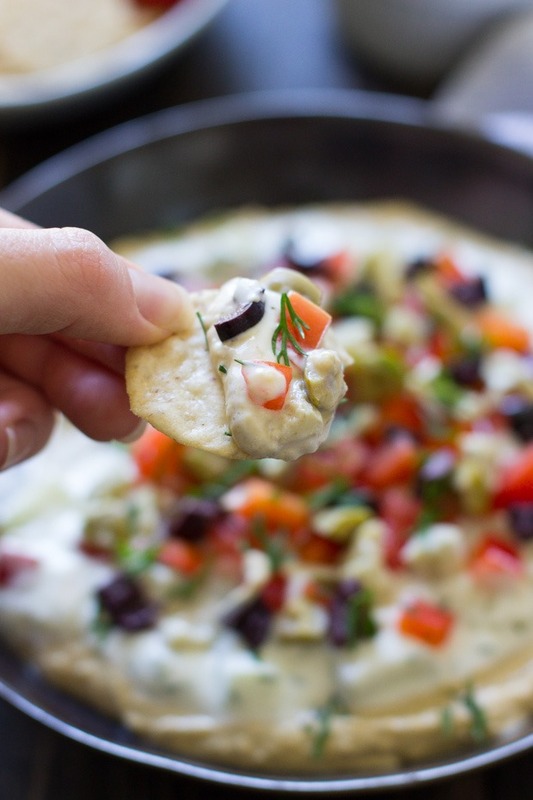 The Nut Thins are light and crispy and they go great with the creamy texture of the dip! Also optional (but recommended) is serving it with a crisp white wine like Chardonnay or Sauvignon Blanc. The tangy flavors pair really well with a slightly acidic and fruity wine. All together it makes for a cool and refreshing option to complement a warm summer day. Cheers to summertime, friends! 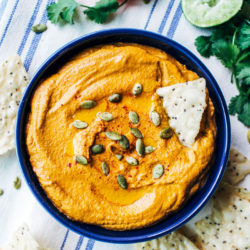 Start by layering the hummus across the bottom of a large (approximately 9-inch) bowl or serving platter then set aside. In a separate small bowl, combine the Greek yogurt, diced cucumber, minced garlic and lemon juice. Sprinkle in a pinch of salt and 2 tablespoons of the fresh dill and stir together. Then layer it on top of the middle of the hummus. Finish by topping with diced red bell pepper, tomato, artichoke hearts and olives then sprinkle with remaining tablespoon of fresh dill. Serve immediately and enjoy! This dip is best served within a few hours of assembling due the watery nature of the cucumber. This post is sponsored by Blue Diamond Nut Thins but all opinions and text are my own. Thank you for supporting the brands that help make this site possible! 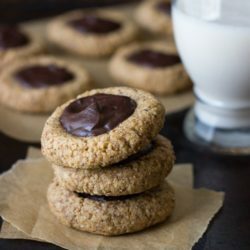 Oh man, I would eat all of this in about 10 minutes. So good! I don’t know what Brandon does for a living, but his job takes him to some awesome places. Still daydreaming about your Switzerland pics. I would love to get to Europe sometime soon, but we’ll see! Your timing with your posts is spot on (i.e. posting about big sur the weekend before I drive through it). 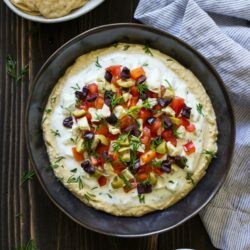 I’m making a mediterreanean feast for my parents’ birthdays this weekend, and I have been hunting around for some fun dip recipes! I can’t wait for the day I can eat this with a glass of crisp Sauvignon Blanc! 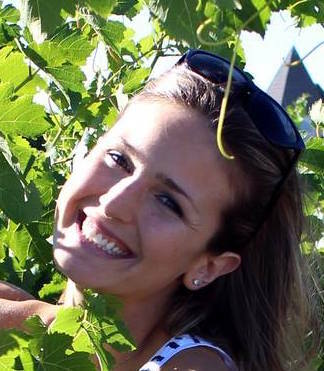 And I’m right there with ya – I am dying to visit the Mediterranean coast! Ohhh man you have made me hungry for lunch! 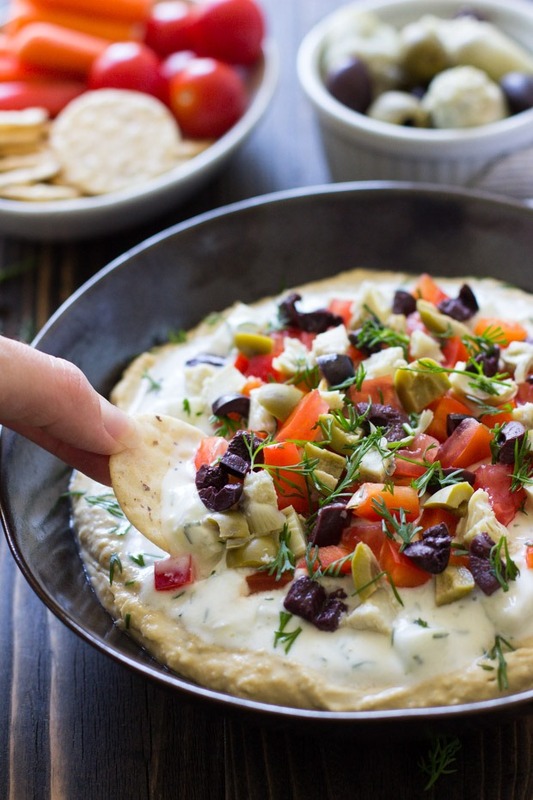 And also wanting to travel to the Mediterranean ;) These are all of my fav toppings, but I would have never thought to combine tzatziki and hummus! Genius. 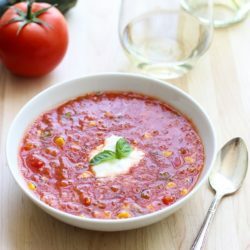 I was just thinking of making a dip very similar to this, haha! 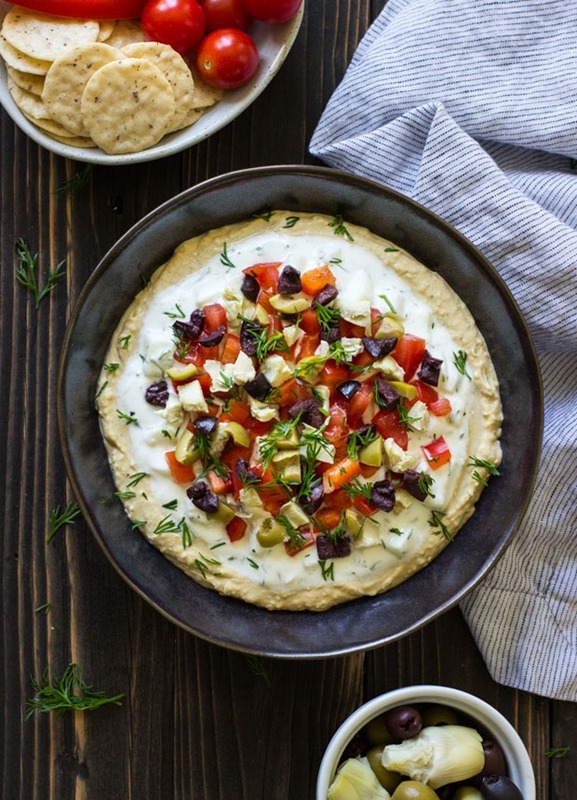 Great hummus minds think alike! I would definitely want to take a trip to somewhere in the Mediterranean too! And I would fully expect to come home 20 pounds heavier! Also, I think a glass of cold white wine with this delicious dip is a must :) I hope you have a great weekend, Sarah! I have a serious Hummus addiction, and real love for Mediterranean food. There’s just something about all of the vibrant colours and fresh flavours they use in the Med! Nothing beats it. 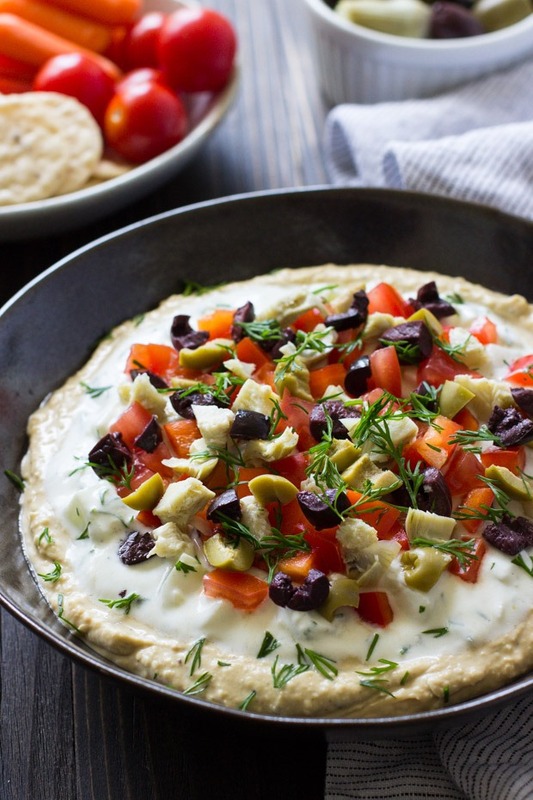 This hummus looks so delicious Sarah, and I love the sound of those Almond Crackers too! What a perfect dip! Oh yesss…. Coco missed you two on your trip. It is so hard on our animals when we travel…. I get it. I think they are more sensitive then we realize, especially when they get older because they have established routines. Six months back to health sounds about what we dealt with for our dearly departed Claire Cat. Ohhh I know. But appreciate it now, for you will travel again, one day. This dip, hands down, has got to be a favorite Summer dip! Wow! The flavors, textures and layers have me drooling, Sarah! What a fabulous combination… with a glass of wine, of course! Thank you for this, Sarah and cheers to you! 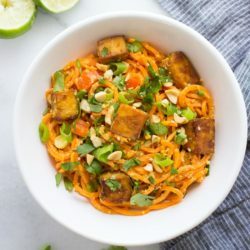 This tip looks so gorgeous and flavorful too! We are currently debating fall travel destinations. I have been to Cassis too – it is incredible – but now you have me wanting to head back to the Mediterranean. So seriously, any time you want to go on a travel-y trip, you hit this girl up, cause I am aaaaaching for travel partners!!! I’ll even help arrange finding a marvelous mutt-sitter so that the hubs can join, too. DROOOOOLLLL!!!! Hummus + GiGi = quite the love affair! This dip is such a great idea!! !